The Jucy Lucy. 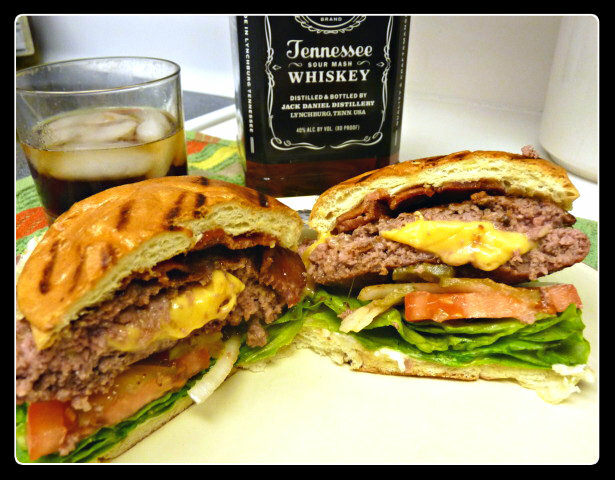 Or the Juicy Lucy. I’m sure you have heard of them before. They’ve been featured on such shows as Man vs. Food, Food Wars and Amazing Eats among others. From my research on the net (which was about 10 minutes before ADD kicked in), it seems like most people believe the Jucy Lucy was invented at Matt’s Bar in south Minneapolis. 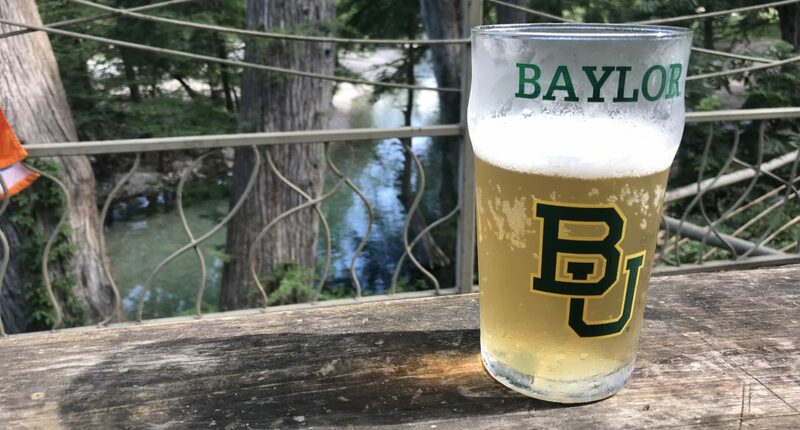 Supposedly staff wear a shirt that says, “If it’s spelled correctly, you are at the wrong place.” Long time rival, the 5-8Club, is just down the street and they spell it Juicy Lucy. They have shirts that say “If it’s spelled right, it’s done right.” Which one invented it? I don’t know. How do we even know that one of them did invent it? Before the internet and food shows on channels like Foodnetwork and Travel Channel, would we have even known of these places? And would we even be familiar with these names? To most of us, these are just called stuffed burgers. I know I had one of these as a kid and nobody was running around calling them Jucy Lucys. Granted, Matt’s claims to have invented it way before I ever came along, but still, I’m sure my folks and their folks were eating them long before that. 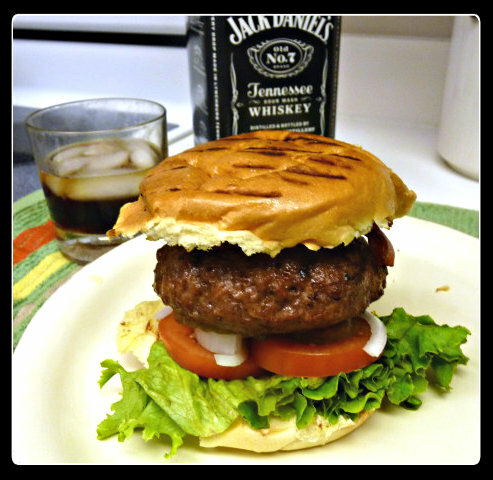 Call them stuffed burgers, call them Jucy Lucys or call them Juicy Lucys. I call them good. “Wait! !” you say? “You haven’t explained what a Jucy Lucy is,” you say? Well, a Jucy Lucy is nothing more than two hamburger patties with cheese sandwiched inside, that melts as you cook it and oozes out when you take a bite. How can that not be good? How about if you add a little bacon on top? You know how we feel about bacon around here. 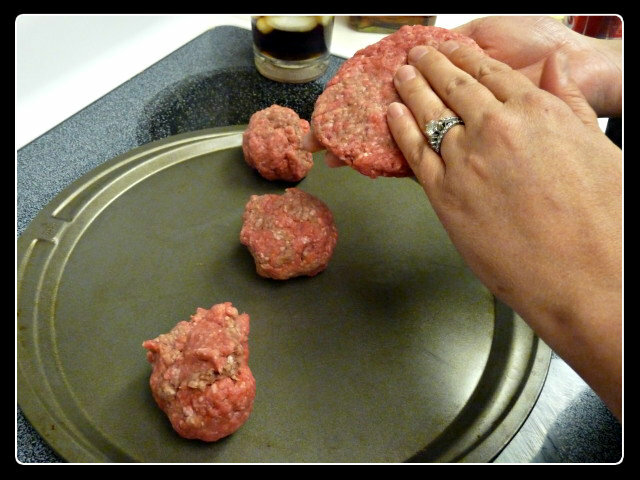 Start out by forming four 4 oz patties. Next, divide your slices of cheese into 4 pieces (you should end up with 12). Place 6 of these pieces on top of one of the patties. Take a second patty and lay it on top of the first patty and cheese. 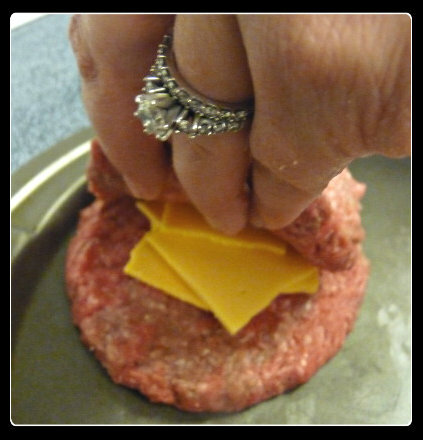 Using your hands, seal the two patties together. Make sure you have a nice seal, or all the cheese will ooze out as you cook them. Repeat with the remaining cheese and other two patties. At this point, I like to take my Jucy Lucy’s (or heck, even regular hamburgers) and toss them in the freezer for 30 minutes. 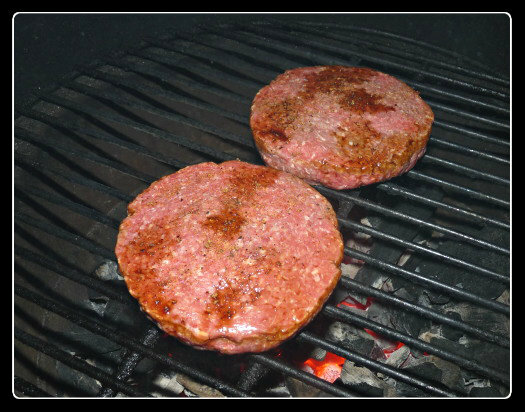 I find that chilling a hamburger patty prior to cooking it, helps it to hold together better on the grill. You like bacon, right? Why not cook it up on a cast iron skillet on your grill? Set up your grill for a direct cook at around 400F (or medium-high). 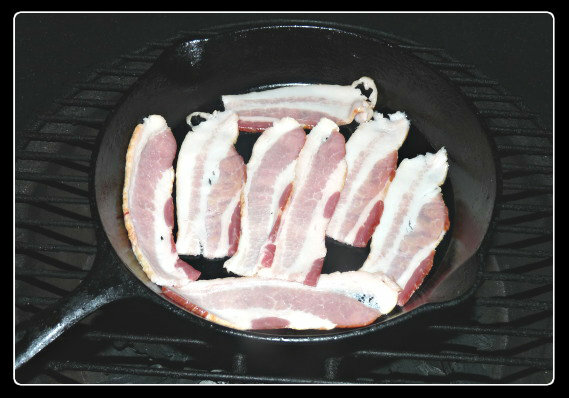 While you are waiting for it to heat up, why not toss on a cast iron skillet and get started on your bacon? These patties got seasoned with a bit of worsey sauce and just a touch of Stubb’s Burger Spice Rub. Salt and pepper, some bbq rub or any other beef rub you like would work just as well. 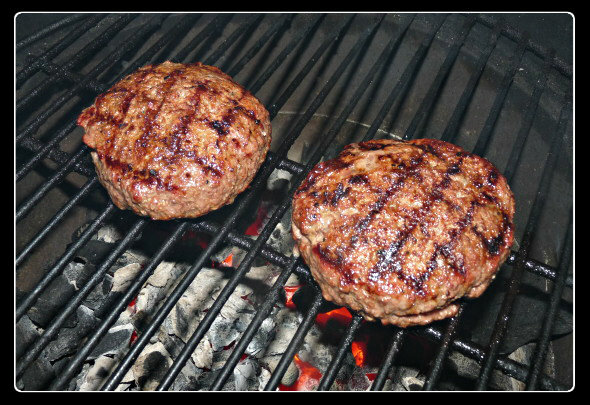 I like to grill my burgers for about 2 minutes, then give them a 90 degree turn to get nice hatch marks. Grill for another 2 minutes or so and then flip. Once again, grill for 2 minutes then turn 90 degrees. After about 8 minutes total, your burgers should be about done. I’m not going to tell you how to build your own burger. Heck, Mrs. G and I don’t even agree on that, but mine got the works this time. 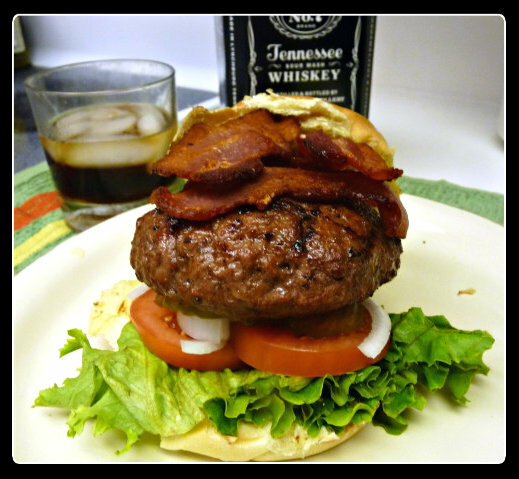 Lettuce, tomatoes, onions, pickles, mustard, mayo, ketchup and what’s a burger without some bacon? Jeez…that’s a mighty big burger!! 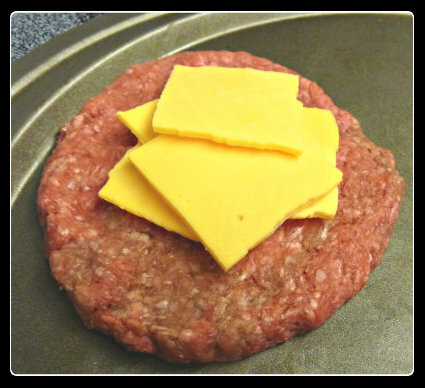 Cut it down to 1 slice of cheese per burger. Try a different cheese. Even though these are originally made with American cheese, and I did go to the deli counter to get good American cheese, I really don’t care for the stuff much. As a kid I did, but next time I think I am going to get a better quality cheese. Not slice it before eating it. After slicing it and trying to get that “perfect picture”, the cheese had cooled down and was no longer meltedy goodness. I want it oozing out next time. You are welcome. What would you stuff your burgers with? I’ve never heard of a Jucy Lucy. But it looks like a cardiologist’s nightmare — which means I’m in love at first bite. What did you sprinkle on the patties? Is that Worcestershire? I had never heard of them before they started appearing on food shows. No clue if they actually invented them or not, seems like a simple idea that has probably been around for a long time. After I pulled my patties out of the freezer, I sprinkled them with a bit of Worcestershire sauce and some Stubbs Burger spice. Jucy Lucys (no “i”) were invented by Matt’s Bar in south Minneapolis. Juicy Lucys (spelled correctly) were invented at the 5-8 Club just down the street. I’ve been fortunate to have had both. Matt’s makes a better burger, but the 5-8 has killer onion straws, so it’s a toss up. I’ve had limited success making them myself. I either have not enough meat to keep the cheese in or too much and the cheese doesn’t get molten. And I agree with you that molten is a must. Stuff them with whatever you want, they will be even better. Do a mix of smoked edam, roasted red pepper, and BBQ sauce inside, that’s a good one we like. But we never do two the same. You’re right on the patties, they should be thin, maybe 3 oz or so.